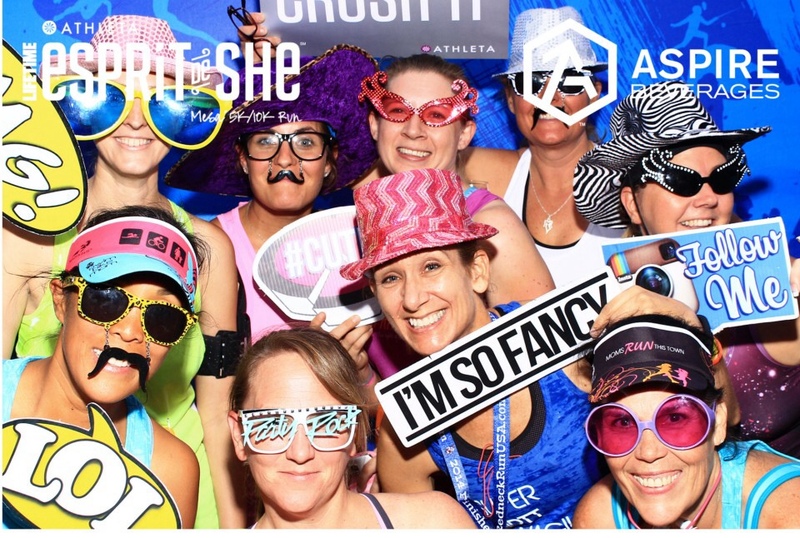 The Esprit de She 5k/10k was such an awesome night: the weather was perfect and while I was having some teeny tiny hamstring/glute issues, I raced this run! Most of my regular running buddies didn’t make it, so it turned into a social media night. I met the Moms Run This Town (MRTT), Arizona Track n Trail (AZ TNT) gals and I even bumped into a couple of twitter friends. Just a few of the awesome Ladies of AZ TNT! Finally met @jsk_az after chatting on Twitter (before the run) and some of the awesome MRTT mamas after they rocked their 10k! Short course, awesome time and a fun night! The SBM Army was out in Mesa! I was sporting my Swim Bike Mom (SBM) visor and another reader noticed and promptly gave me a “Yay! Swim Bike Mom!” cheer. I also saw fellow SBM Esther (Swim Bike Mom Ambassador AZ) while she was rocking her 10k but I wasn’t fast enough to get a picture! This year the race was at the Mesa Riverview Park. Overall, I don’t think that it was a scenic as Tempe Beach Park (nothing beats running across the pedestrian bridge at night! ), but it was still a fast and fun course. I had such a great time at this event last year that I signed up to be an ambassador for this race. I promoted it through the MRTT facebook groups, but my numbers won’t show that since I shared my friends’ code because of her discount. Regardless, I wished there was an ambassador meet-up, I just wasn’t proactive enough to start one. I picked up my packet the day before and I was juggling kiddos before I left, so I arrived to the venue later than my usual. As you can see from the pictures above, I did make it into some of the pre-race photos. It’s always nice to put face with names, especially Helly from hellyontherun (another Ambassador) and others that I see online. I waited a little too late to use the restroom, so there was a long line and I missed the pre-race Zumba and stretching festivities. I was glad that I did wait, because I literally bumped into a twitter friend I kept missing! We chatted a bit and took a selfie before the 5k start. When the 10k runners started, I started my warmup. I always get nervous and excited before a race so I’ve learned to jog out my excess energy. It also helps to get warmed up. Before I knew it, it was time for the 5k. I started towards the back of the pack, and I slowly wound my way up through the field. Since the 10k runners were doing two loops, I got to see the runners several times throughout the race. Sammi, the Sunday run lead at Cadence, had an early lead and she was followed closely by many of the AzTNT gals. I loved being able to cheer them on as they ran. They are gazelles! I was feeling great during the run. I was keeping up with a couple of gals and that’s when I realized that I should have studied the course a little better. I kept thinking that the end was near, when we were no where close! That’s the mental game of the 5k. A little past the halfway mark, there was a stretch that was a long stretch in the grass and I felt the need to slow down a bit. It was hard to see, since the floodlights were shining right in our eyes. I was afraid that I was going to find a hole! Thankfully, no holes were found and I didn’t trip. We ran around the rest of the water feature and then we made our way to the finish! Right before the finish, I caught up to the MRTT mamas who were running the 10k I cheered them on before it was my turn to cross the finish line. I was so pumped because I crossed the finish line well before 30 min, but then I realized that my watch measured the course a little short. It’s all good, because I had a chance to hangout with some really awesome ladies afterwards! Cheers to an awesome ladies race night! 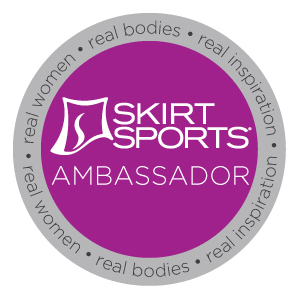 **I’m an Esprit de She Ambassador for 2014. I paid for my race entry before I was selected as an ambassador. I was given promotional materials for being an ambassador, but these opinions are my own. Posted in Ambassador, RacesTagged 5k, esprit de she, race, recapBookmark the permalink. Fall Race Season is Here! !